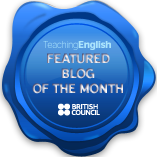 On Thursday 28 June I was honoured to give my first webinar, asking the question what makes a lesson GREAT?, for the British Council Teaching English team. Thanks go out to the 70 or so participants who gave up luchbreaks, dinner times or sleep to attend – I deeply appreciate it! If you couldn’t make it, or if you would like to relive the experience, the recording of the whole session including Q&A is now online (duration: 67 minutes).